Read the exhibition essay by Myung-Sun Kim. The Theatre Centre is a barrier-free location. ᓴᓇᙳᐊᖅᑏᑦ: ᑯᕆᔅᑏᓐ ᐋᑕᒥ, ᓗᑦᓴᐅᓛᓯ ᐊᑭᓱᒃ, ᓴᓚᒨᓂ ᐊᓲᓇ, ᐊᓚᔅᐊ ᕼᐋᑕᓇᑲ. ᓴᓚᒨᓂ ᐃᕙᓗᐊᕐᔪᒃ, ᐹᕐ ᔫᓯᐱ, ᒨ ᑲᓕ, ᓵᑭ ᓄᓇ, ᑕᐃᕕᑎ ᐸᓪᓚᑦ, ᑕᖅᑭᐊᓗᒃ ᐳᓪᓚᑦ, ᑖᓂᐊᓕ ᕿᐊᑦᓱᒃ, ᑲᕕᓐ ᕿᒻᒥᕐᐱᒃ, ᐃᖃᓗᒃ ᖁᕕᐊᓇᖅᑐᓕᐊᖅ, ᑖᒥᖁᕕᐊᓇᖅᑐᓕᐊᖅ, ᔫᓯ ᓴᐃᓚ, ᓲᓯ ᓴᐃᓚ, ᐃᔨᕙᓪᓗ ᓴᐃᒪᔪᐃᓕ, ᔮᓂ ᓴᐃᒪᔪᐃᓕ, ᓰ ᑕᖅᑭᐊᑦᓱᒃ, ᐹᑐᕆᒃ ᑖᒻᓴᓐ, ᐊᒻᒪᓗ ᔪᐊᓇᓯ ᑐᓂᓪᓕ. ᐃᓅᖃᑎᒌᑦᓯᐊᓂᖅ ᐃᓄᒃᑎᑐᑦ ᐱᒻᒪᕆᐅᕗᖅ ᐃᓄᓐᓄᑦ ᐊᒻᒪᓗ ᑐᑭᖃᖅᐳᖅ ‘ᑐᙵᓇᕐᓂᖅ ᐊᓯᒥᓂ, ᐃᓚᒌᑦᓯᐊᕐᓂᖅ ᐊᒻᒪᓗ ᐃᑉᐱᒍᓱᑦᓯᐊᕐᓂᖅ ᐃᓄᓐᓄᑦ.’ ᓴᖅᑭᑎᑕᐅᓂᑯ ᐃᓄᓐᓄᑦ ᒪᒃᑯᑦᑐᓄᑦ ᑭᙵᕐᓂᑦ (ᑭᙵᐃᑦ, ᓄᓇᕗᑦ) ᐊᒻᒪᓗ PA System Collective, ᓴᓇᔭᐅᓯᒪᔪᑦ ᐱᓕᕆᐊᖑᔪᖅ ᐅᑯᓄᖓ- ᑎᑎᖅᑐᕋᖅᓯᒪᔪᑦ, ᓴᓇᙳᐊᖅᓯᒪᔪᑦ, ᐊᒻᒪᓗ ᐋᕿᑦᓱᐃᓂᖅ- ᐆᒪᑎᑦᑎᕗᖅ ᐃᓅᓯᕐᒥᑦ ᐅᑭᐅᖅᑕᖅᑐᕐᒥᑦ, ᐊᒻᒪᓗ ᓈᒻᒪᑦᑎᐊᖃᑦᑕᖏᑦᑐᖅ ᓄᓇᓕᖕᓄᑦ ᑲᒪᑦᑎᐊᕐᓂᖅ, ᐃᓚᒌᓐᓂᖅ, ᐊᖏᖃᑎᒌᓐᓂᖅ, ᐊᒻᒪᓗ ᑐᑭᓯᖃᑎᒌᑦᓯᐊᕐᓂᖅ. ᑕᒪᓐᓇ ᒪᑐᐃᖓᓂᖅ ᐱᖃᓯᐅᑎᓯᒪᕗᖅ ᐊᔾᔨᖑᐊᓂᑦ ᑕᒪᑐᒪ ᑎᑎᖅᑐᖅᓯᒪᕗᑦ ᖃᓄᖅ ᓇᒻᒥᓂᖅ ᑐᑯᓐᓇᖅᑕᒥᓂᒃ ᐊᒻᒪᓗ ᑐᑯᓐᓇᖃᑦᑕᐅᑎᒻᒥᔪᑦ ᓇᓪᓕᓐᓂᑯᑦ ᐊᒻᒪᓗ ᐃᑉᐱᒍᓱᓐᓂᒃᑯᑦ; ᓱᕐᓗ ᑕᐅᑐᙳᐊᖅᑐᒋᑦ ᐃᒪᕐᒥᐅᑕᙳᐊᑦ ᖃᐅᔨᓪᓗᒋᑦ ᐃᓱᒪᒥᓂᑦ ᐱᔪᓐᓇᕐᓂᖃᖅᑎᓱᓂᒋᑦ ᐆᒪᔪᑦ ᐃᓅᖏᑦᑐᓂ ᐊᒻᒪᓗ ᐃᓅᔪᓄᑦ. ᐊᑕᐅᑦᓯᒃᑯᑦ, ᐱᓕᕆᔭᐅᓯᒪᔪᑦ ᐃᓅᖃᑎᒌᑦᓯᐊᓂᒃᑯᓐᓄᑦ ᖃᓄᖅ ᐊᔾᔨᒌᖏᑦᑐᑦ ᓄᓇᓖᑦ ᐊᔾᔨᖃᖏᑦᑐᑦ ᓇᑭᑐᐃᓐᓇᖅ ᐊᒻᒪᓗ ᐅᕙᑦᓯᐊᕈᓂᓴᑦ ᑲᐃᒍᓐᓇᖅᑐᑎᑦ ᐊᑕᐅᑦᓯᑯᑦ ᑐᙵᓇᕐᓗᑎᑦ ᐊᒻᒪᓗ ᐃᑉᐱᒍᓱᖃᑎᒌᑦᓯᐊᕐᓗᑎᑦ ᑎᑎᖅᑐᒐᓂᒃᑯᑦ ᓴᓇᙳᐊᕐᓂᒃᑯᓪᓗ- ᑕᒪᑐᒪᓂ ᐊᖏᑲᑎᒌᑦᓯᐊᕐᓂᒃᑯᑦ ᓄᓇᖃᖅᖄᓯᒪᔪᓄᑦ ᐅᑭᐅᖅᑕᖅᑐᕐᒥᑦ. 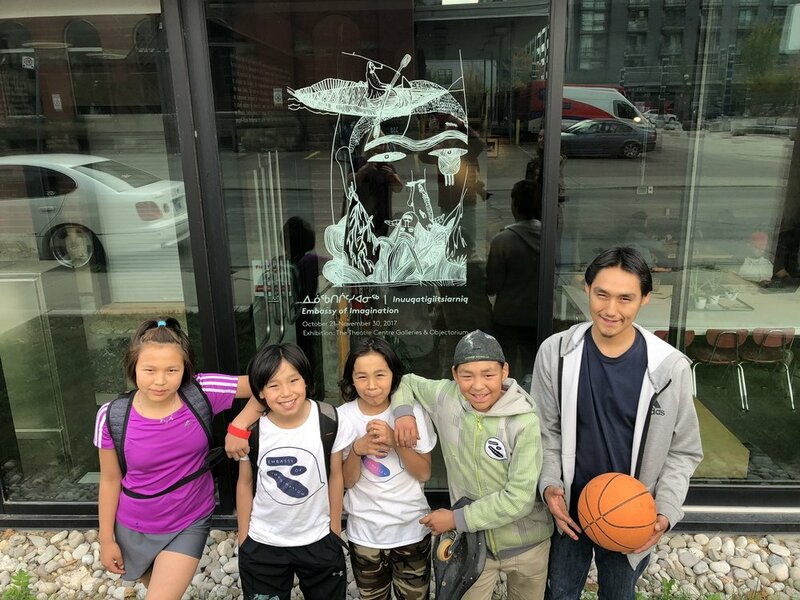 ᐱᓕᕆᐊᖑᔪᖅ ᐅᑯᓄᖓ ᐱᓕᕆᖃᑦᑕᖅᐳᑦ ᑎᑎᖅᑐᕋᕐᓂᒃᑯᑦ ᐃᖃᓇᐃᔭᖃᑎᒌᖃᑦᑕᖅᐳᑦ ᐃᓄᐃᑦ ᒪᒃᑯᑦᑐᖏᑦ ᑭᖓᕐᓃᙵᖅᓯᒪᔪᑦ (ᑭᙵᐃᑦ, ᓄᓇᕗᑦ), ᐱᓕᕆᐊᖑᓯᒪᔪᖅ ᐊᓚᔅᐊ ᕼᐋᑕᓇᑲᒧᑦ ᐊᒻᒪᓗ ᐹᑐᕆᒃ ᑖᒻᓴᓐᒧᑦ PA Systemᑯᓐᓂᑦ. Access information: The Theatre Centre is a barrier-free accessible location. 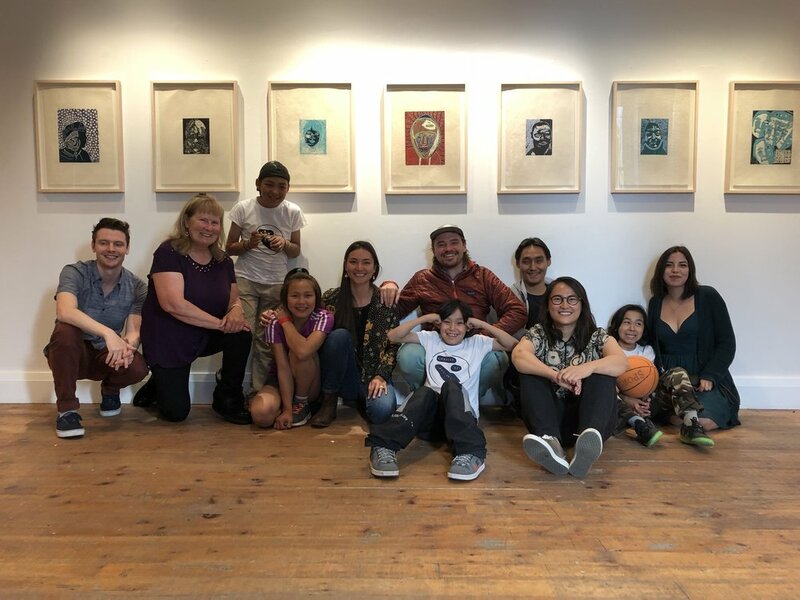 Artists: Christine Adamie, Lachaolasie Akesuk, Salomonie Ashoona, Alexa Hatanaka, Salomonie Ivaluajuk, Harry Josephee, Parr Josephee, Moe Kelly, Saaki Nuna, David Pudlat, Taqialuk Pudlat, Daniel Qiatsuk, Kevin Qimirpik, Iqaluk Quvianaqtuliaq, Tommy Quvianaqtuliaq, Josie Saila, Susie Saila, Ezeevalu Samayualie, Johnny Samayualie, Cie Taqiasuk, Patrick Thompson, and Joanasie Tunnillie. Inuuqatigiitsiarniq in Inuktitut is one of the core Inuit societal values and translates as ‘respecting others, relationships and caring for people.’ Created with Inuit youths from in Kinngait (Cape Dorset, Nunavut) and PA System, the collaborative works by Embassy of Imagination - prints, drawings, sculptures, and installation - animates the life of the north, and the complexities of community care, kinship, solidarity, and empathy. 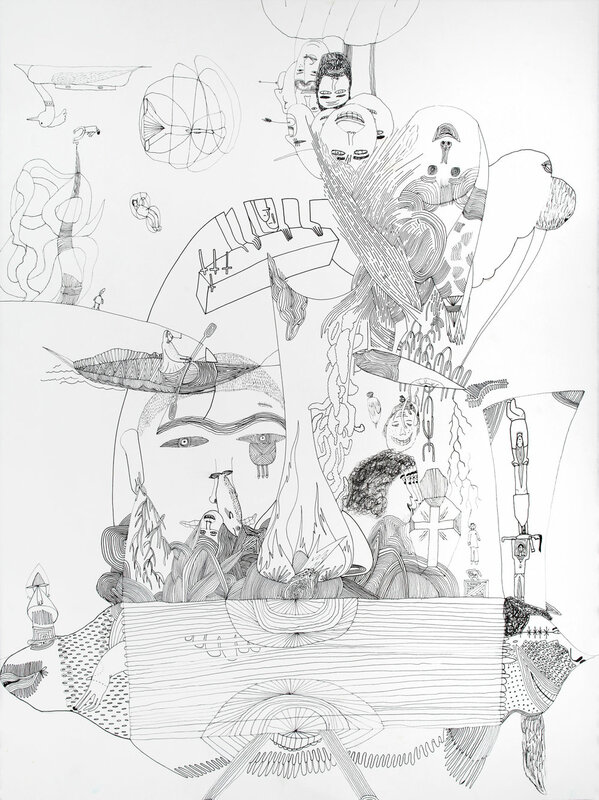 This exhibition includes a series of portraits wherein artists illustrates how they see themselves as well as each other through affirmations of love and care; speculative drawings of sea creatures realized from their imaginations put forth the possibilities for living amongst non-humans and humans. 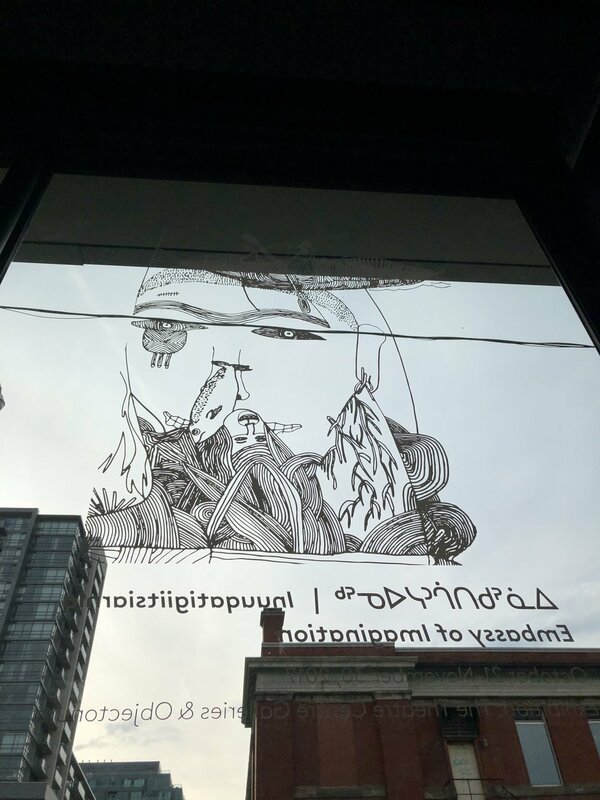 Together, the works in Inuuqatigiitsiarniqexplore how intercultural communities from different places and histories can come together to respect and care deeply for each other through artmaking - one way of acting in solidarity with the Indigenous North. The Theatre Centre sits on the traditional lands of the Anishinaabe, Haudenosaunee and Wendat peoples. 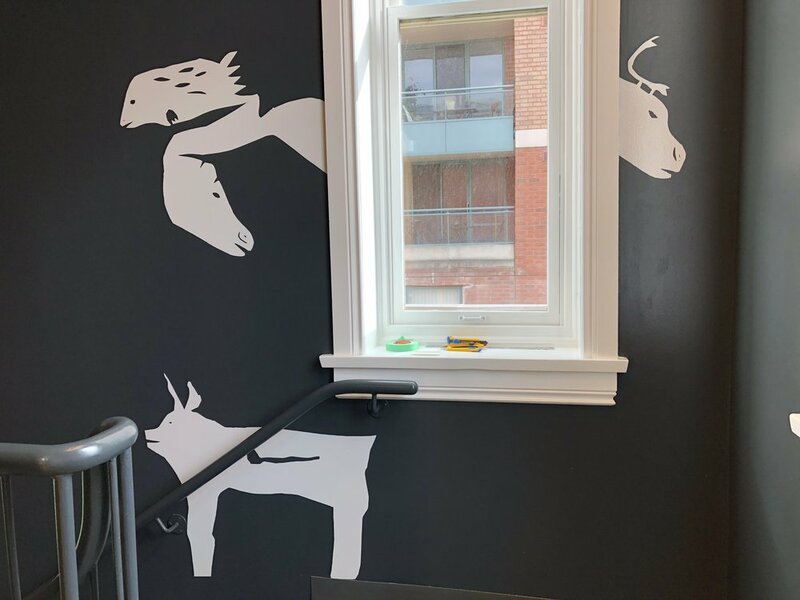 We are a live-arts incubator with exhibition and public engagement programming, that serves as a research and development hub for the cultural sector. We are a barrier-free, accessible public space, located at the corner of Queen and Lisgar.